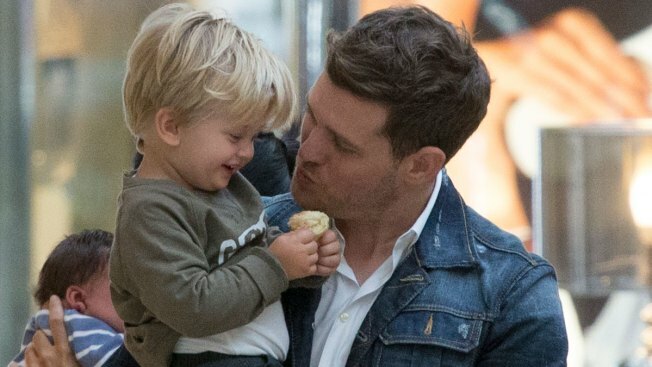 Michael Buble and son Noah sighting on April 28, 2015 in Madrid, Spain. Michael Bublé and Luisana Lopilato have good news to share. After announcing in November that their 3-year-old son, Noah Bublé, was undergoing treatment for cancer in the U.S., the couple gave E! News an update on his development Friday. "We are so grateful to report that our son Noah has been progressing well during his treatment and the doctors are very optimistic about the future for our little boy," said the couple, who married in 2011 and also have a 1-year-old son, Elias Bublé. "He has been brave throughout and we continue to be inspired by his courage. We thank God for the strength he has given all of us." In January, Bublé pulled out of hosting the BRIT Awards to focus on his family. Officials with the pop music award show "completely understood" the musician's decision, The Sun reported. X Factor presenter Dermot O'Leary and radio DJ Emma Willis were tapped to fill in for Bublé. Bublé also pulled out of a BBC Music Awards performance in December. When Bublé shared his son's diagnosis via Facebook last year, he wrote, "We are devastated about the recent cancer diagnosis of our oldest son Noah who is currently undergoing treatment in the U.S. We have always been very vocal about the importance of family and the love we have for our children. Luisana and I have put our careers on hold in order to devote all our time and attention to helping Noah get well. At this difficult time, we ask only for your prayers and respect for our privacy. We have a long journey in front of us and hope that with the support of family, friends and fans around the world, we will win this battle, God willing."